“The Magic Quadrant (MQ) are a series of market research reports published by the United States research and advisory firm, Gartner, which aim to provide a qualitative analysis into a market and its direction, maturity and participants. Their analyses are conducted for several specific technology industries and are updated every 1–2 years. Leaders – Vendors in the Leaders quadrant have the highest composite scores for their Completeness of Vision and Ability to Execute. A vendor in the Leaders quadrant has the market share, credibility, and marketing & sales capabilities needed to drive the acceptance of new technologies. These vendors demonstrate a clear understanding of market needs, they are innovators and thought leaders, and they have well-articulated plans that customers and prospects can use when designing their infrastructures and strategies. In addition, they have a presence in the five major geographical regions, consistent financial performance, and broad platform support. Challengers – A vendor in the Challengers quadrant participates in the market and executes well enough to be a serious threat to vendors in the Leaders quadrant. They have strong products, as well as sufficiently credible market position and resources to sustain continued growth. Financial viability is not an issue for vendors in the Challengers quadrant, but they lack the size and influence of vendors in the Leaders quadrant. Visionaries – A vendor in the Visionaries quadrant delivers innovative products that address operationally or financially important end-user problems at a broad scale, but has not yet demonstrated the ability to capture market share or sustainable profitability. Visionary vendors are frequently privately held companies and acquisition targets for larger, established companies. The likelihood of acquisition often reduces the risks associated with installing their systems. 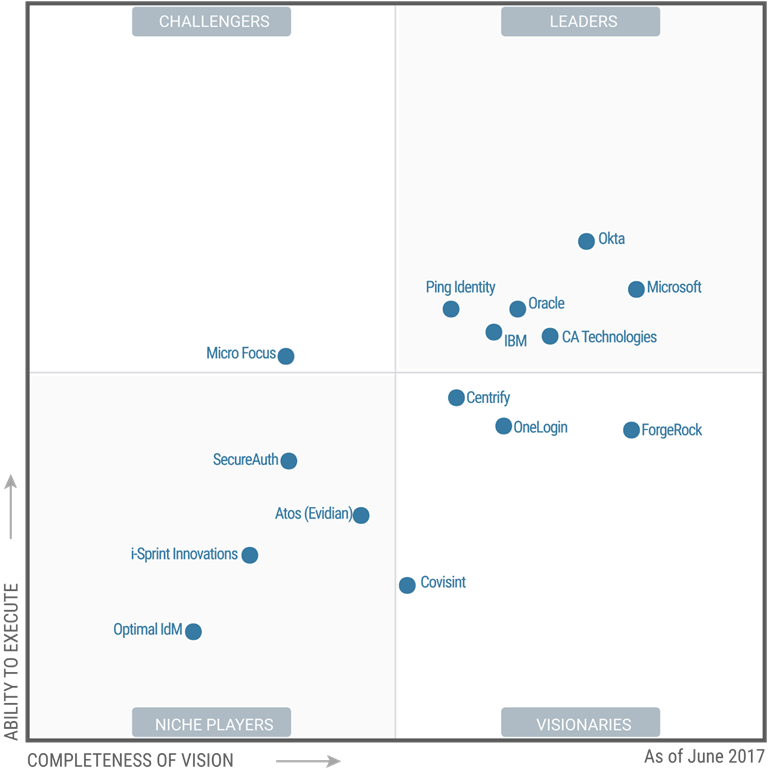 And now that you know all that information, let’s get to the facts: Gartner released their 2017 Magic Quadrant for Access Management (AM MQ), which shows that Azure Active Directory is placed in the “leaders” quadrant and is positioned very strongly for completeness of vision. The full Gartner report can be found here. As you can see, Microsoft is a leader, providing a complete identity and access management solution for employees, partners, and customers, all backed by world-class identity protection based on Microsoft’s Intelligent Security Graph.